A former Essex county cricketer has admitted a corruption charge relating to a 40-over one-day game against Durham. Mervyn Westfield, 23, admitted accepting or obtaining a corrupt payment to aid spot betting on a match on 5 September 2009. The Old Bailey heard he agreed to bowl his first over in a way that would let Durham score a set number of runs. The England and Wales Cricket Board (ECB) said the case "sent a message". Westfield was warned he could face jail when he is sentenced in February. The offence carries a maximum sentence of 10 years in prison. He was granted unconditional bail until sentencing on 10 February. A separate charge of assisting another person to cheat at gambling was ordered to lie on file. Judge Anthony Morris told the court he understood Westfield had agreed to concede 12 runs in exchange for £6,000 but only 10 runs were in fact conceded during the first over. 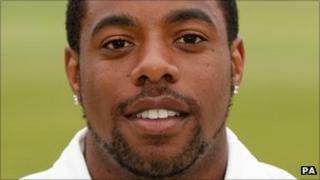 The judge also said the person who offered Westfield the money was known by people involved in cricket. Westfield is the first English cricketer to be guilty of spot fixing. His case follows the jailing of three Pakistani cricketers and an agent last year over spot fixing during a Test Match between England and Pakistan. Spot betting involves wagers on specific events or incidents in a game and is very popular with gamblers across the world. However an illegal element called spot fixing developed when sports people were bribed to fix events so a few people in the know could place bets at high odds to make money by cheating. In a press statement, the England and Wales Cricket Board (ECB) said the case had shown there could be no complacency to the potential threat posed by "corrupt activities" at all levels of sport. "This case sends out a clear message to all players and officials that spot or match fixing is a criminal activity and punishable in law," it said. "We will, of course, continue to do our utmost to ensure that cricket is free from any corrupt activity." Essex and Kent police investigated allegations that this activity was being carried out in county cricket. In the Westfield case the police forces said they were helped by the International Cricket Council, the England and Wales Cricket Board (ECB), Essex County Cricket Club and the UK Gambling Commission. A spokesman said the prosecution was the first use of prevention of corruption legislation relating to a sporting event. Det Sgt Paul Lopez said: "This was a ground breaking case and highly complex. "We are pleased that Mervyn Westfield has admitted the charge and we hope that this sends a strong message to professional sportsmen and women around the country. "If they intend to get involved in spot fixing, or think that match fixing is not a crime, then they need to think again." Angus Porter, the chief executive of the Professional Cricketers' Association, said: "The world has moved on quite a long way since he committed those offences. "We've invested a huge amount in educating players as to their responsibilities, but I think that none of us can be complacent. "I think that we are all very mindful of the need to make sure that sport is played properly." Essex County Cricket Club declined to comment on Westfield's case at this stage.